Khurrana won the second season of reality television show MTV Roadies in 2004 and ventured into an anchoring career. He made his film debut in 2012 with the romantic comedy Vicky Donor. His performance earned him several accolades including the Filmfare Award for Best Male Debut. Following a brief setback, he starred in the commercially and critically successful romance Dum Laga Ke Haisha. Khurrana went on to establish himself with the comedies Bareilly Ki Barfi (2017), Shubh Mangal Saavdhan (2017), and Badhaai Ho (2018), and the thriller Andhadhun (2018). Khurrana's performance as a blind pianist in the latter won him the Filmfare Critics Award for Best Actor. In addition to acting, Khurrana has sung for all his films, including the song "Pani Da Rang", which earned him the Filmfare Award for Best Male Playback Singer. Khurrana was born on 14 September 1984 in Chandigarh to Anita and P. Khurrana, as Nishant Khurrana, later his parents changed his name to Ayushmann Khurrana when he was 3 years old. He studied at St. John's High School and DAV College in Chandigarh. He majored in English literature and has a master's degree in Mass Communication from the School of Communication Studies, Punjab University. He did serious theatre for five years. He was also the founding member of DAV College's "Aaghaaz" and "Manchtantra", which are active theatre groups in Chandigarh. He conceived and acted in street plays and won prizes in national college festivals such as Mood Indigo (IIT Bombay), OASIS (Birla Institute of Technology and Science, Pilani) and St. Bedes Shimla. He also won a Best Actor award for playing Ashwatthama in Dharamvir Bharati’s Andha Yug and was invited to the 2017 Actors' Roundtable hosted by Rajeev Masand. Ayushmann Khurrana was noticed on TV at the age of 17. It was the reality show on Channel V; PopStars in 2002. He was one of the youngest contestants on the show. Roadies took place in 2004 whereby he turned out to be the winner in Roadies 2 at the age of 20. After completing his graduation and post-graduation in Journalism, his first job was as an RJ at BIG FM, Delhi. 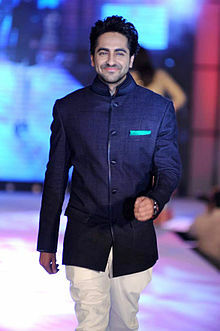 He hosted the show Big Chai – Maan Na Maan, Main Tera Ayushmann and also won the Young Achievers Award in 2007 for it. He was the youngest recipient of the Bharat Nirman Award in New Delhi. After radio, Khurrana moved on to become a Video Jockey on MTV with Pepsi MTV Wassup, The Voice of Youngistaan, an informative show for the youth. He also worked in many other MTV shows such as MTV Fully Faltoo Movies, Cheque De India and Jaadoo Ek Baar. He then turned television host with a multiple-talent based reality show India's Got Talent on Colors TV which he co-anchored with Nikhil Chinapa and Stripped which gave latest updates on the Indian TV industry with a comic tinge, again on MTV. At the end of the year, he was also the anchor of the singing reality show Music Ka Maha Muqqabla on STAR Plus. Apart from hosting the second season of MTV Rock On and India's Got Talent on Colors, Khurrana was also a part of the anchoring team of Extra Innings T20 for Indian Premier League Season 3 on SET Max with Gaurav Kapur, Samir Kochhar , and Angad Bedi. Following which he took up the offer of anchoring the dance-based reality show Just Dance on STAR Plus. In 2012, he made his Bollywood debut with Shoojit Sircar's Vicky Donor opposite Yami Gautam. The film marked actor John Abraham's debut as a producer. He portrays Vicky Arora who marries a Bengali girl without telling her about his past as a sperm donor. Despite its small budget, the movie became a major commercial success and received critical acclaim. For the film, he also sang the song "Pani Da Rang" composed by him and Rochak Kohli. Both the movie and song were well received. Khurrana received critical acclaim for his performance. Taran Adarsh notes: "Ayushmann is a complete natural, has all the trappings of a fine actor and delivers a super confident performance". Gaurav Malani adds that Khurrana "is so natural that it never seems he's acting but rather gliding through the role. He is a pro at both the comedy and emotional scenes". Khurrana went on to receive many accolades for his performance, including the Filmfare Award for Best Male Debut and the Filmfare Award for Best Male Playback Singer. He won all the debut awards for Vicky Donor. He followed by anchoring the IIFA Awards (2012), People's Choice Awards India (2012) and the Screen Awards (2013). Khurrana later appeared in a PETA ad campaign, encouraging pet owners to have their dogs and cats sterilized. Khurrana was next seen in Rohan Sippy's Nautanki Saala co-starring Pooja Salvi, Kunal Roy Kapoor and Evelyn Sharma. The film opened to positive reviews from critics, with Taran Adarsh stating that the film was "uncontaminated, witty and amusing". Nautanki Saala was released on 12 April 2013. The film managed to recover its production cost at the domestic box office, earning approx. ₹210 million (US$2.9 million). Khurrana's first film of 2014 was Yash Raj Films's Bewakoofiyaan, directed by Nupur Asthana, in which he starred alongside Sonam Kapoor and Rishi Kapoor. He was also the playback singer for "Khamkhaan" from the same movie, with Neeti Mohan. The film released on 14 March 2014 to mixed reviews and was commercially unsuccessful at the box office. However, his performance was well received by critics. Anupama Chopra of Hindustan Times praised Khuranna's performance, saying: "The strongest performance here is Ayushmann's. His anger and frustration at losing the good life are palpable". The following year, he played the role of scientist Shivkar Bapuji Talpade in the biopic Hawaizaada which also failed at the box office. His next release was Sharat Katariya-directed Dum Laga Ke Haisha (2015), which opened to strong reviews, whereas critics appreciated the acting of Ayushmann, the film was a major box office success under production of Yash Raj Films. The film also won the National Film Award for Best Feature Film in Hindi. Khurrana didn't have any releases in 2016. After two years-long absence from the screen, he starred in Akshay Roy's romance drama Meri Pyaari Bindu opposite Parineeti Chopra. However, despite the anticipation, the film received mixed reviews and was a commercial failure. Later in 2017, Khurrana featured in two more movies, Bareilly Ki Barfi and Shubh Mangal Savdhan both of which received critical and popular acclaim and were commercially successful. He also received a nomination for the Filmfare Award for Best Actor for his role as a Gurgaon guy in the latter. Khurrana had two releases in 2018. His first release was the crime thriller Andhadhun, alongside Radhika Apte and Tabu. He was cast as Akash, a pianist pretending to be blind. The film, and Khurrana's performance, received critical acclaim. With earnings of ₹111 crore (US$5 million), Andhadhun emerged as Khurrana's highest-grossing release. He won the Filmfare Critics Award for Best Actor and gained another Best Actor nomination at the ceremony. Khurrana's second and final release of 2018 was the comedy-drama Badhaai Ho, co-starring Neena Gupta, Gajraj Rao, Sanya Malhotra, Sheeba Chaddha and Surekha Sikri. He played the role of Nakul Kaushik, a man whose 52-year-old mother Priyamvada (played by Gupta) gets pregnant when he was in a relationship with his colleague named Renee (played by Malhotra). The film received positive reviews from critics, and was a commercial success. Days before the release of the film, Khurrana was a guest at India Film Project where he discussed about the film and what went on behind the screen along with Amit Sharma. As of 2019, Khurrana has several upcoming projects. He is all set to star alongside Nushrat Bharucha in the romantic comedy Dream Girl and alongside Isha Talwar in the investigative drama Article 15. He has also signed to feature in the satire comedy Bala, and will also star in the romantic drama Shor Shagun Ladki, co-starring Arjun Kapoor, Amrita Puri and Bipasha Basu. Khurrana was born in Chandigarh. His father P Khurrana is an astrologer and an author on the subject of astrology, whereas his mother Poonam Khurana is a housewife and she is of half-Burmese descent and a qualified M.A. in Hindi. While Ayushmann remains busy with his work in Mumbai, his family still stays in Chandigarh. His brother Aparshakti Khurana is a radio jockey at Radio Mirchi 98.3 FM in Delhi and made his debut in the 2016 Aamir Khan-starrer film Dangal. The ambiance of literature at home influenced Khurrana as well and he took to writing as a hobby. He also maintains a blog where he writes in Hindi and it has been received very well by his admirers. Ayushman is known for being very close to his family and wife, Tahira Kashyap who has directed a critically acclaimed film Toffee. They are childhood sweethearts and are parents of a son and a daughter. His son, Virajveer, was born on 2 January 2012 and his daughter, Varushka, was born on 21 April 2014. 2013 Saddi Gali Nautanki Saala! ^ "Vicky Donor is a HIT". Indicine.com. Retrieved 10 March 2015. ^ "After Back-To-Back Hits, Ayushmann Khurrana Knows He's Become A Star But He Doesn't Want To Believe It". Indiatimes. 21 October 2018. Retrieved 22 October 2018. ^ "Winners of the 64th Vimal Filmfare Awards 2019". Filmfare. 23 March 2019. Retrieved 23 March 2019. ^ "Ayushmann turns 31; Bollywood wishes him". BollywoodMantra. Retrieved 14 June 2018. ^ "I've evolved as an actor: Ayushmann Khurrana". IANS. The Express Tribune. 28 April 2013. Retrieved 5 June 2016. ^ "Ayushmann's Portfolio Pics". The Times of India. Retrieved 5 June 2016. ^ a b c "Lesser known facts about Ayushmann Khurrana". The Times of India. 21 September 2015. Retrieved 5 June 2016. ^ "Ayushmann's Portfolio Pics". Maharashtra Times. Retrieved 5 June 2016. ^ "City boy is MTV's most popular Roadie". The Tribune. 1 December 2004. ^ "RJ Ayushmann of BIG 92.7 FM creates history: Wins Young Achievers Award". India PRwire. 1 May 2007. ^ "Ayushmann Khurrana - Ayushmann Khurrana Biography". www.koimoi.com. Retrieved 4 January 2016. ^ "MTV launches Three Films". Telly Chakkar. 10 September 2008. ^ "In conversation with the host- Ayushman and Nikhil". BuzzG.com. 30 June 2009. ^ "Ayushmann to host Music Ka Mahamuqabla". Indya.com. 30 June 2009. ^ "Max Unveils Mega Extra Innings T20 for IPL 2010". Zimbio.com. 10 March 2010. ^ "Ayushmann Khurrana to host Superstar Buzz". Star Plus. 30 October 2010. ^ "Ayushman's film debut". Indya.com. 23 June 2011. Retrieved 11 October 2011. ^ "I might cast a Kolkata girl: Shoojit Sircar". The Times of India. 6 July 2011. Retrieved 11 October 2011. ^ "Vicky Donor gets very good reviews from film critics - Filmibeat". Entertainment.oneindia.in. 23 April 2012. Retrieved 10 March 2015. ^ "Ayushmann's film debut as Sperm Donor". The Times of India. 6 October 2011. Retrieved 11 October 2011. ^ Adarsh, Taran. "Vicky Donor (2012) Movie Review". Retrieved 26 January 2012. ^ Malani, Gaurav. "Vicky Donor: Movie Review". The Times Of India. Retrieved 26 January 2012. ^ "Vicky Donor". IMDb. Retrieved 4 January 2016. ^ Vijay Singh,"Ayushmann Khurrana poses with condom for dog sterilizations," The Times of India 15 December 2015. ^ "Abhishek calls Ayushmann 'Nautanki Saala'". Bolly Spice. ^ "Bhushan Kumar finalises April 12 for Nautanki Saala". Retrieved 26 January 2012. ^ "Box-Office Verdict 2013 | Box Office Collection of all 2013 Releases". Koimoi.com. 9 January 2015. Archived from the original on 3 August 2014. Retrieved 10 March 2015. ^ Tushar Joshi (14 March 2014). "Film Review: Bewakoofiyaan plays it too safe to rise above the ordinary | Latest News & Updates at Daily News & Analysis". Dnaindia.com. Retrieved 10 March 2015. ^ "Movie review by Anupama Chopra: Bewakoofiyaan is a bland tale of yuppies. Bewakofiyaan floped at the box office". Hindustantimes.com. 15 March 2014. Retrieved 10 March 2015. ^ "Ayushmann plays a Marathi scientist in Bambai Fairytale". The Indian Express. ^ "Ayushmann starrer Bambai Fairytale re-titled Hawaizaada". bollywoodhungama.com. 19 May 2014. Retrieved 7 June 2014. ^ "First look: Ayushmann in Dum Laga Ke Haisha". filmfare.com. Retrieved 4 January 2016. ^ "Watch: Parineeti Chopra sings and announces the title of her new film". CNN-IBN. 9 February 2016. Retrieved 9 February 2016. ^ Hungama, Bollywood (30 May 2017). "Box Office: Understanding the economics of Yash Raj Films' Meri Pyaari Bindu - Bollywood Hungama". Bollywood Hungama. Retrieved 27 October 2017. ^ "Bareilly Ki Barfi crosses 30 crore mark at the box office". Deccan Chronicle. 6 September 2017. Retrieved 27 October 2017. ^ "'Shubh Mangal Saavdhaan' box-office collection fourth weekend: Ayushmann Khurrana-Bhumi Pednekar film collects Rs 41.50 crore in total - Times of India". The Times of India. Retrieved 27 October 2017. ^ "Ayushmann Khurrana has Burmese genes". Bollywood Hungama. 22 March 2017. ^ "Ayushmann Khurrana's brother to make debut in Dangal". ^ "Ayushmann My brother is more like Vicky: Ayushmann Khurrana". Times of India. 20 March 2014. ^ "Ayushmann Khurrana: I had Rs 10,000 in my account when I got married". NDTV. 20 March 2014. ^ "Why Ayushmann Khurrana's Wife Tahira Kashyap Is Trending". ^ "It's a girl for Ayushmann Khurrana and wife Tahira!". The Times of India. 22 April 2014. ^ "Ayushmann names his daughter Varushka". Filmfare. Retrieved 12 May 2014. ^ "Mitti Di Khusboo new song by Ayushmann Khurrana". India Today. ^ "YAHIN HOON MAIN Full Video Song | Ayushmann Khurrana, Yami Gautam, Rochak Kohli | T-Series". ^ "Ayushmann Khurrana's book is a cheat sheet for anyone with a dream". Hindustan Times. Wikimedia Commons has media related to Ayushmann Khurrana. This page was last edited on 20 April 2019, at 08:12 (UTC).